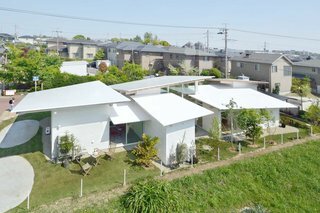 Six-Sheet Roof House is a minimalist home located in Nagoya, Japan, designed by Studio Velocity. The residence, situated within a quiet residential area in front of an elementary school, is for three couples and their children. The architects wanted to create a series of eaves on top of each volume that would be higher towards the center, and lower towards the edges. The line connecting the highest point and the lowest point among the four ends of each roof surface forms a diagonal in order to channel the flow of rainwater. Light and wind pass through to bring brightness inside. uploaded Six-Sheet Roof House through Add A Home.